Lily's Ink Pad: Times Flies When UR Having Fun! Really, I am still around. I just have been busy, busy, busy. This time of year always does this to me. The weather is nicer, so I spend more time outdoors. I get a nesting instinct so clean more. I feel a need to see my family and friends. Plus, the school year is ending and I need my every ounce of energy to deal with middle schoolers who are less than motivated this time of year. Enough excuses. More projects! My friend and fellow demonstrator Connie came up with this design using the Matchbox Bigz die and the Big Shot. This design makes a perfect wedding favor. A few modifications and it will make a great favor for any occassion! 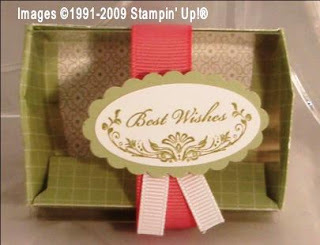 Accessories: Big Shot, Matchbox Bigz XL Die, Window Sheet, 1/4 Grosgrain Whisper White, 5/8 Regal Rose Grosgrain Ribbon. A tip I learned: When adhering the matchbox top to the paper, use a bone folder to squish the mini glue dot. The adhesive dissapears (well, almost).